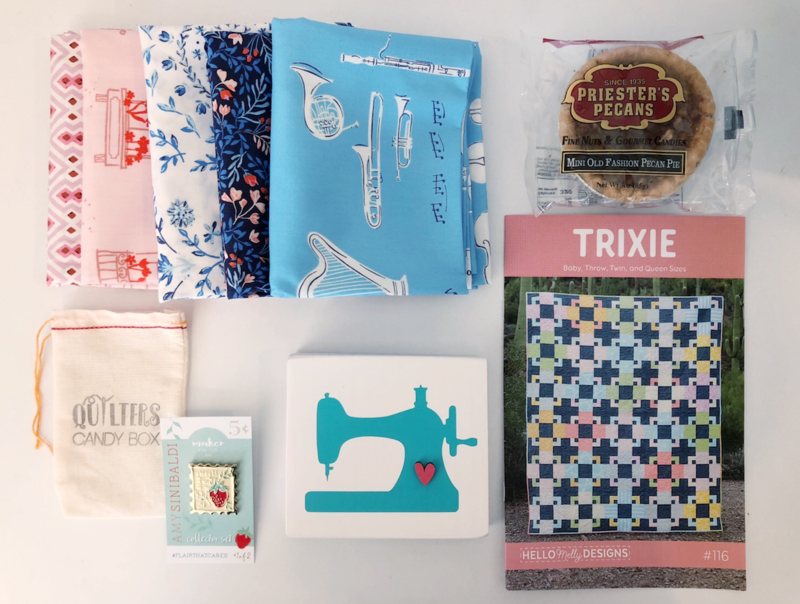 • 5 half-yard cuts of Amy Sinibaldi's new "Sonata" fabric for Art Gallery Fabrics • Trixie, an exclusive pattern written by Melanie Colette of Hello Melly Designs • "Stay Sweet" enamel pin designed by Amy Sinibaldi with Maker Pin Co. Quilter's Candy Box is the first to release this pin! • Custom, one-of-a-kind, wooden sewing machine block. Katie Sabin of Just Add Sunshine worked with us to make these custom blocks. • A mini pecan pie, the perfect Fall treat!